The term ‘First World War’ was first coined in September 1914 by German philosopher Ernst Haeckel who claimed “there is no doubt that the course and character of the feared ‘European War’ … will become the first world war in the full sense of the word.”. For millions of men all over the world, including more than 8 million who served in the British Forces alone, Haeckel’s words became terrible reality. Few corners of the world were left untouched, new technologies lead to insurmountable casualties and horrific new injuries, as well as new theatres of war. The first aerial bombings of civilian targets; the first uses of mustard and chlorine gases; the first use of tanks; the first blood banks; the first ever use of the value trillion to estimate the cost of the war in 1919 all lead to the feeling that this was the war to end all wars. Surely there could be no worse suffering than this. The Treaty of Versailles, not signed until 28th June 1919 (hence many war memorials listing 1914-1919) officially agreed the end of the war. One Article in the treaty, Article 231, later to be labelled the War Guilt Clause required Germany “[to] accept the responsibility of Germany and her allies for causing all the loss and damage” during the war. The treaty forced Germany to disarm, make substantial territorial concessions, and pay reparations to certain countries that had formed the Entente (Allied) powers. In 1921 the total cost of these reparations was assessed at 132 billion Marks (roughly equivalent to US $442 billion or UK £284 billion in 2013), a sum that many economists at the time, notably John Maynard Keynes, deemed to be excessive and counterproductive. The argument by Keynes that the terms were too harsh—a “Carthaginian peace”—convinced many British and American leaders, but left the French unmoved. The result of the competing and sometimes conflicting goals among the victors was a compromise that left none contented: Germany was not pacified or conciliated, nor permanently weakened. The problems that arose from the treaty would lead to the Locarno Treaties, which improved relations between Germany and the other European Powers, and the renegotiation of the reparation system eventually resulting in their abolishment in 1932. It is the opinion of many a historian that Article 231 was also instrumental, through careful interpretation, in the rise of National Socialism in Germany. In short, The War to End All Wars was to be, at least in part, a cause of the larger and even more costly struggle just twenty years later. In those lives there are lessons. We would do well to remember them. When undertaking any fieldwork project this early stage tends to be the most exciting – exploring the area, getting to know the people and places you’ll be working with and generally learning as much as you can as quickly as possible. Neither myself or Steve come from a standing start for this project, but after just a few fieldwork report entries we’re both seeing interesting results. 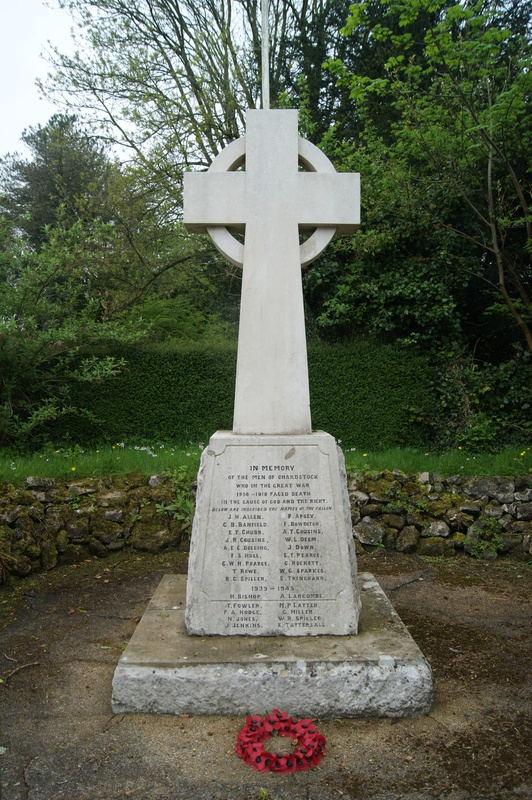 Take Pitminster for example, a memorial to those from the Parish who died in the First (here and commonly at the time called the Great War) and Second World Wars. It’s beautiful location is well over a mile from the actual village, half way up a hill next to a well used commuter route. Today if a memorial is built it is usually easy to visit, easy to see and a centrepeice of a population centre. 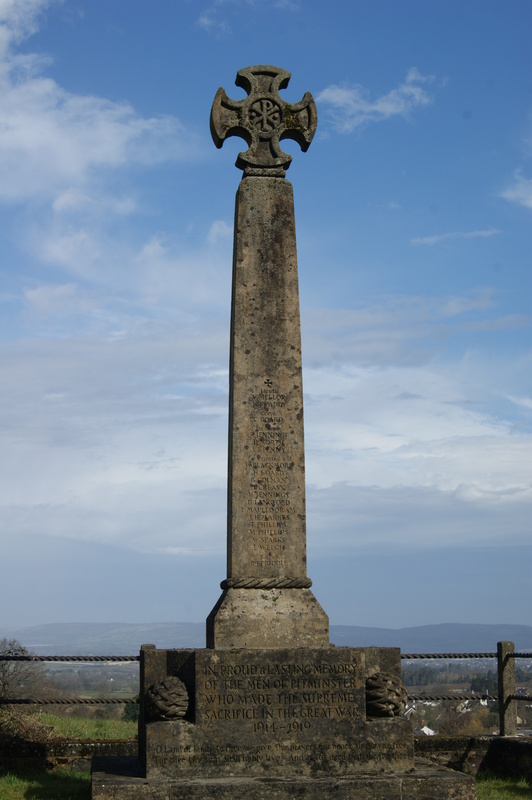 Although Pitminster’s Memorial, half way up Blagdon Hill, is impressive in itself, it suffers badly from its exposure to the elements and has become difficult to visit next to an increasingly busy road. For these reasons and more Pitminster PCC, the Memorial’s custodians, have voted in favour of moving the War Memorial to a more suitable position within the village (see http://www.pitminsterparish.org.uk/pitminster-parish-plan.php). A modern reminder of the continued importance of remembrance. Pitminster not only highlights the importance of War Memorials to today’s communities, it also presents us with some interesting data. Firstly, it is the only war memorial we have ever seen which gives the dates of the Second World War as 1939-1946. It is probable that one of the people on the 2WW side of the memorial died in 1946 (perhaps in the on-going unrest in places such as Palestine), and the dates are altered to allow for this, or it could be a simple mistake on the part of the insciber, which is unlikely. The inscriptions are unusually descriptive and seem to be well thought out. The photo below shows the First World War side, and the text ‘…MEN OF PITMINSTER…’ – in that conflict only men from the village perished. On the reverse side it states ‘…PARISHIONERS OF PITMINSTER…’ – one lady is commemorated. Whilst this is far from unique it is unusual to be able to discern just from reading the memorial which force any individual served in. We know a lady is listed because the forces are also given: Army, Navy, RAF and WAAF (Womens Auxiliary Air Force). We are creating this database for people today to use to discover the secrets which lie beneath the names in the stone, the stories behind the real people who lived and died, and to learn any lessons their stories might teach.